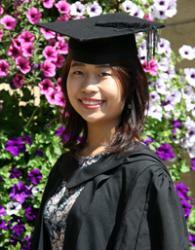 Man Sum Chan (Elly)After a strong performance throughout her studies, an award-winning student from Bangor University graduated this week. Elly, who comes originally from Hong Kong, said about her time at Bangor: “I taught piano and did some volunteering during my study. Volunteering has broadened my horizon and I have made friends from different countries. “I have participated in many interesting projects whilst at Bangor; performing fusion music at a local museum, teaching Chinese folk music at a local primary school and organising concerts for the elderly in a care home.